It’s taking longer for me to complete a project than it use to. Before, I would run through a project cycle in a couple of weeks. Today, with my other job nicking my shop time, I’m lucky to complete a project in a couple of months. Spending too long on a piece makes me slower and tends to drag down my interest, so I decided to begin a second project. While the time to completion on one project pushes farther out, I’m able to maintain interest and enthusiasm by switching between the two ongoing projects. 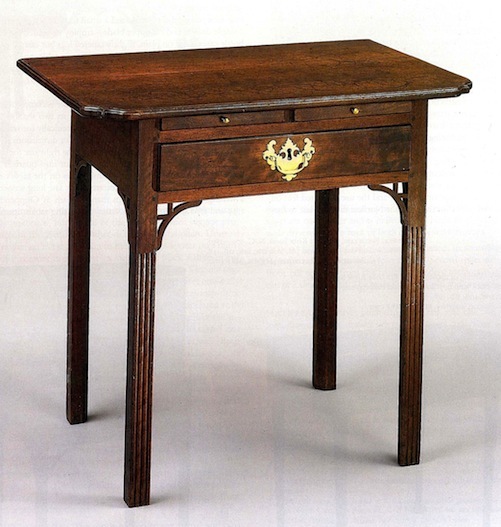 The second project I began this week is the above pictured writing table found at Colonial Williamsburg – my first exposure to it was in the book “Southern Furniture 1680 – 1830” (Harry N. Abrams, Inc.). I’m not sure why I’m so captured by southern furniture. I expect it’s due to the simplicity of the designs. This project build begins with the legs. As I pulled lumber off the rack, I thought about what makes legs look the best. My first thought is that it depends on the wood. I’m building this table with mahogany, and its feathered grain does not show a strong difference between flat-cut and quartersawn woods, especially in pieces that are 1 9/16″ wide. On the other hand, maple does show a strong difference when comparing the two cut types. So what do you look for? The photo above shows the three ways most lumber is cut, and how each would appear in a leg found on this table. When you see this, I hope it’s obvious which cut is better choice. It’s rift cut. In rift-cut lumber, all four faces of the legs closely match in grain appearance. If you build using rift-cut stock, tapered legs look best, whether you’re cutting a two-sided taper or are tapering all four sides. An even bigger difference is found if this same philosophy is applied to cabriole legs, but you also need to align your grain in the right orientation with legs found on Queen Anne and Chippendale furniture. Here’s what I mean. If you align your cabriole leg so the foot is across the grain, as shown above and to the left, you get rings or circles at the knee of your leg. These circles are not appealing, but the issue is more than aesthetics. That circle pattern indicates a weakness as you slide down to just above the ankle. That’s where your leg can break as the grain crosses the narrow cut of the leg. If you orient the foot so it’s with the grain, as shown to the left, you get a much stronger and more pleasing end result. Notice there is no ring at the knee. 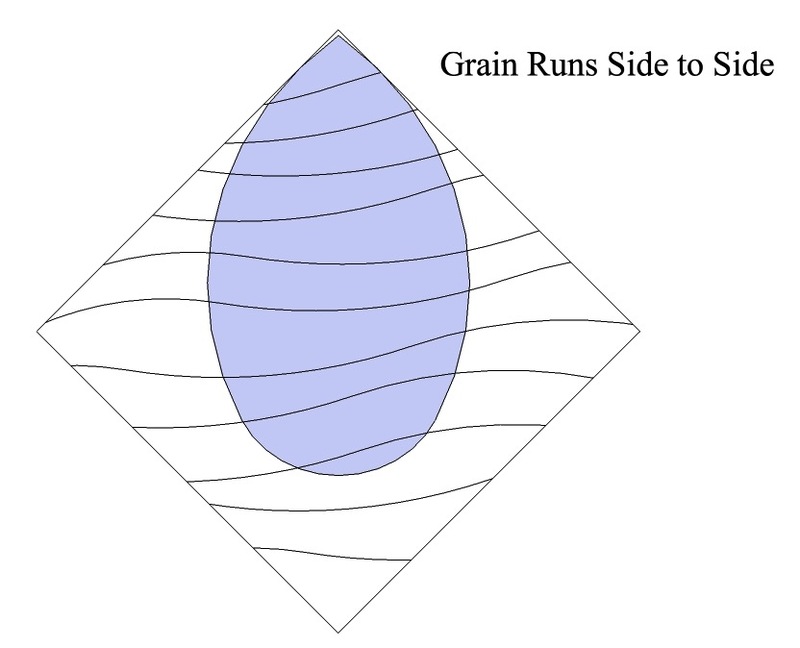 The grain runs pretty much up and down the entire leg. That means there is no weak point at or above the ankle. 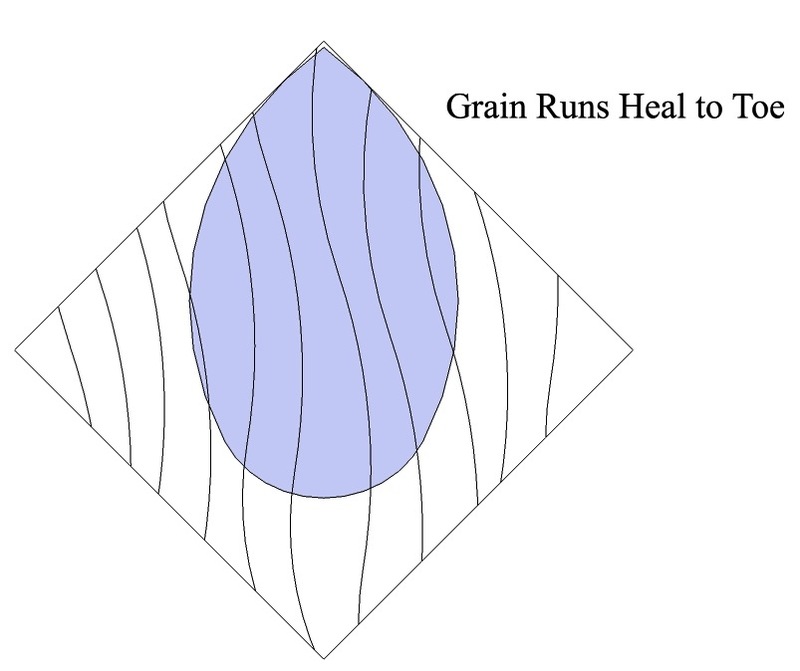 This leg should not fracture during its life because the weight is carried through the leg as it follows the grain.